Anytime a large mass moves around either at ground level, above ground level, or below ground level the gravitational attraction will change. I believe that this has yet to be demonstrated. Now check this out. While the experiments with the absolute gravimeter devices are unreliable, as we saw with the information I provided above, the type of experiments used in the equivalence principle tests are incredibly reliable. 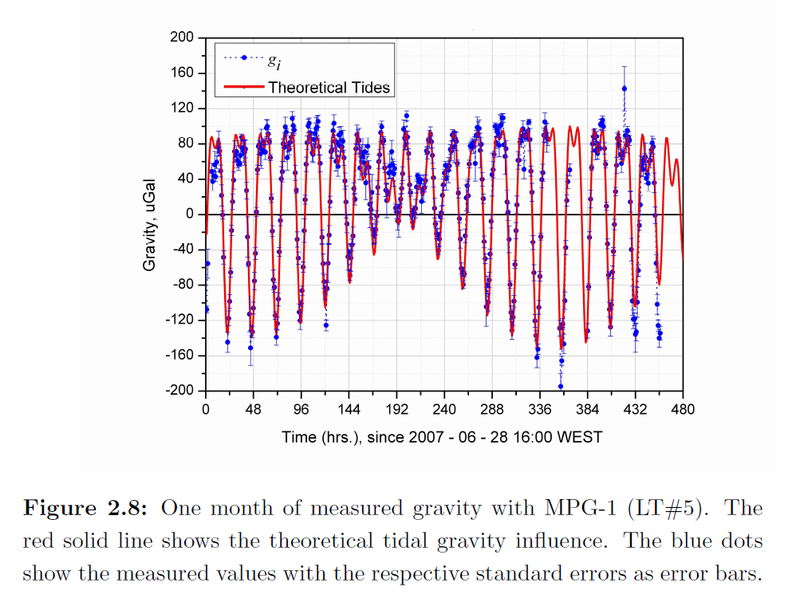 Experimenters have redesigned the equivalence principle torsion balance tests to try and detect the gravity changes of the sun and the moon, and the tidal forces, set the experiment was set to run for long periods of time, and found that they could not. The test was accurate to one part in one hundred billion. The gravitational influence of the sun, moon, or anything else, could not be detected. It's not "The gravitational influence ... could not be detected". The Princeton group ... concluded that the Sun´s gravitational acceleration on identical aluminum and gold masses was the same to one part in one hundred billion. Of course you can accept the results of this experiment. Maybe there has been no errors in any of the measurements, or maybe the identical results are just a fluke, who knows? The main issue is that the results of the experiment don't pertain to the discussion at hand. It's just a diversion. Shame on you. Absolute gravimeters measure the force of gravity very accurately. Please provide a specification for what you would consider as accurate and reliable. That way data may be provided to meet those standards. Specifically, as the Earth spins on its axis and difference between the Sun's gravitational interaction with the two masses will result in a 24 hour modulation or oscillation, in the orientation of the balance arm as seen in the laboratory. 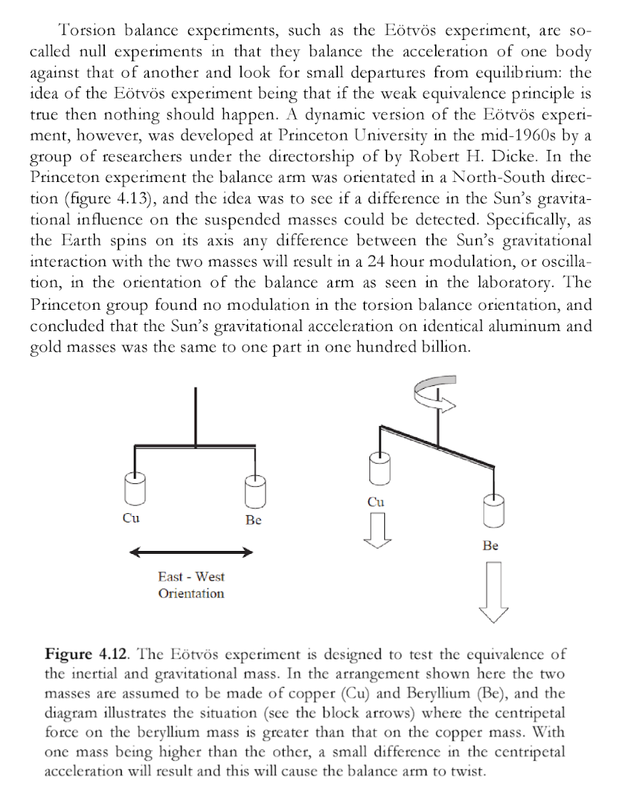 The Princeton group found no modulation of the torsion balance, and concluded that the Sun's gravitational acceleration on identical aluminum and gold masses was the same to one part in one hundred billion. It was nice to see that someone has gone to great lengths to confirm that gravitational and inertial mass are essentially the same. Now check out the link above and you can see some other scientists that went the extra mile in eliminating all the possible sources of error and measured the gravitational constant. Effectively they were doing the Cavendish experiment on steroids. The errors keep getting smaller & smaller. Firstly, according to Newtonian Gravity, all objects move at the same rate towards the earth uniformly. That is its defining feature, and this operates suspiciously as if the earth were accelerating upwards. False. As already mentioned above, objects accelerate at different rates depending on their distance from the centre of the earth. What is the force acting upon an apple at the surface of the earth, ie. 6,371,000m from the centre of the earth? So the mass of the apple cancels out.What is the acceleration of the apple at 100m above the surface? I am using microGal as the unit of measurement because we know that modern precision gravimeters have an error of only plus/minus 5 microGal. So the difference attributable to height should be easily measured. Now FE theory attempts to explain such differences by ‘celestial gravity’ but (i) this reintroduces the very notion that the article tries to refute and (ii) it remains unexplained why the observed differences in acceleration at different heights conform precisely to the predictions of the RE model. Note also that if celestial gravitation is the effect of Sun and Moon, which are constantly on the move, gravimeters should observe differences in acceleration over the period of the day. But no such differences are observed. And of course no explanation is forthcoming about the dramatic effects of latitude (about 5 million microG from equator to pole). Tom's earlier objection about the accuracy of gravimeters rests upon an extraordinary error of comprehension, as shown above. What's so hard to understand in this paragraph? Obviously you don't understand it. Or you are deliberately holding on to your misconceived citing. Of course there is a gravitational interaction, but the experiment is setup this way, that only if the gravitational interaction would be different for the identical aluminum and gold masses, then there would be something else than a null result. The whole experiment does not measure absolute gravitational forces. It measures only the difference of gravitational acceleration of masses of equal weight but of different material. So your post is off topic! How is it that the absolute gravimeters could be affected by air pressure and a number of other effects listed and described if the device utilizes a vacuum chamber? On analysis of the gravimeter we find that the device is not directly measuring gravitational acceleration at all. It is measuring noise and using many software algorithms to cancel out the noise. Every part of the device's components—the lasers which measure the motion, the mirrors, the springs which launch the mass up and down the small tube, and all component parts—are all connected in some manner to the earth, and are subject to noise and vibrations. One of the most serious problems for absolute gravimeters is the vibration disturbances. for the first observation on an observation wheel works well, though, not for the other two observations. To reduce the vibration of the carrier, we can choose two different approaches. From the above we see that a need to use algorithms and filters to find gravity from noise. The levels of g are not readily apparent, and must be constructed by subtracting from the noise to 'find gravity'. The above passage states that "We can expect to find the variations of gravity consists of components with long period, however the vibration of the carrier with short periods." Is the process of subtracting vibrations with one characteristic to reveal other vibrations truly measuring gravity? Why does "gravity" need to be found? We see that the process involves extensive data analysis, filtering, and cleanup from noise — to 'find gravity'. followed by a filtering step that removes most of the noise by low-pass filtering the data. least 7 times the measured frequency is suggested. Once all of these items and their theoretical uncertainties are subtracted, we are left with "gravity." The main conclusion from this is, however, that the tides may be related in some manner to vibration or noise that is being processed. No mechanism is presented, or is identifiable, from a long term analysis of vertical vibration trends. The gravimeter measures fringe noise, not the "level of g". The output is the result of specialized filtering. That, after the final filtering and analysis, there may be trends at the top of a mountain, or in an environment which sits on a large amount of compressed ice, or with different environmental affects, should not be surprising. Gravity itself is not readily identified from the above processes. Can you provide us with a more direct way of determining what you imagine to occur? One that does not rely on an author's ability to account for all phenomena in nature? It is pretty clear to me. An incredibly sensitive experiment was set up to see if the sun's gravitational influence could be detected on masses and it could not. Yes indeed, modern gravimeter measurements are unbelievably precise, for the reasons you have suggested, and the links are useful, thanks for these. Simply raising the height of the instrument by 1cm will change the reading by 3.086 microGal, which is why measurement on a ship presents such a challenge. The gravimeter can measure differences of 1 microGal, i.e. 100 millionth of 1 ms^2. This is why precision measurement is such a challenge. But it is a challenge because of the Newtonian mechanics, not in spite of it. The illustrated experiment was nice. Of course, the null result of the experiment would be the same (zero output) whether the machine was on or off. How do we know if the machine was even turned on? Even if you could prove that the machine was turned on and produced a zero output you still have the objective of the whole experiment wrong. Now we know (if the machine was on) that the suns gravitational attraction produces a gravitational acceleration that’s independent of the mass just like we see on earth. Galileo showed this a long time ago on the earth. Gravitational force is real and it’s measurable. The sun has gravity, and the earth and moon have gravity. Without that universal force of gravity the whole solar system would fly apart. By arguing over a few parts per million of the actual measured force of gravity you are effectively saying “Yes there’s a force of gravity, it’s just that your measurement accuracy doesn’t satisfy me”. If you still have some doubts about gravity and the detection of it by gravimeter, here's another way. All of the traditional causes of error have now been totally eliminated. On analysis of the gravimeter we find that the device is not directly measuring gravitational acceleration at all. It is measuring noise and using many software algorithms to cancel out the noise. The instrument is simply measuring acceleration, period, and it is doing this incredibly accurately, with very little noise. To determine the acceleration due to gravitational attraction is a separate issue. If the UA hypothesis is correct, there is no acceleration due to the earth's gravity at all. But then UA has to explain how, given the observed precision of the instrument of at most 5 microGal, we see an observed acceleration difference of 5 million microGal between equator and pole. There is no noise. Here is another way of illustrating the point about noise. The chart below shows a series of observations (145 in all) of acceleration using an absolute gravimeter, the first set taken at 77 degrees latitude, the second set at 74 degrees. You see they are different. You will also ask ‘where is the noise’, given both lines appear completely flat. Answer: the noise is there, but you would need a magnifying glass to see it. For example, reading 1 is 982972760.4, reading 2 is 982972761.1. A difference of 0.7. But the average difference between the two sets of readings is 107,117.2. The noise is inaudible, relative to the phenomenon (difference in acceleration) we are observing. The hypothesis of Universal Acceleration, which implies there should be no difference in acceleration at the two latitudes, is inconsistent with these observations. Noisy differences such as lunar attraction, atmospheric pressure, tiny differences of height etc., do not figure. It looks like gravity is in UA is out. Do you need a little more evidence? Check out the Red Shift experiment. According to Einstein particles will loose energy while moving against GRAVITY. That will mean you can expect to see photons loose energy as they move against earth's GRAVITY. There will be a frequency change toward Red in the spectrum while traveling against the force of GRAVITY. The experiments that were done have been improved and the errors mostly eliminated. What all this means is that any acceleration of the earth is irrelevant in the experiments. It wouldn't matter if the earth were accelerating upwards at any rate. What is being measured is GRAVITY. Now you could still have UA, if you want, but you will be required to factor in GRAVITY because of the actual, accurate, experiments done. Just what number for GRAVITY will you choose to believe? I believe that the GRAVITY of this situation is extreme. Edby, you have provided no source for that image. 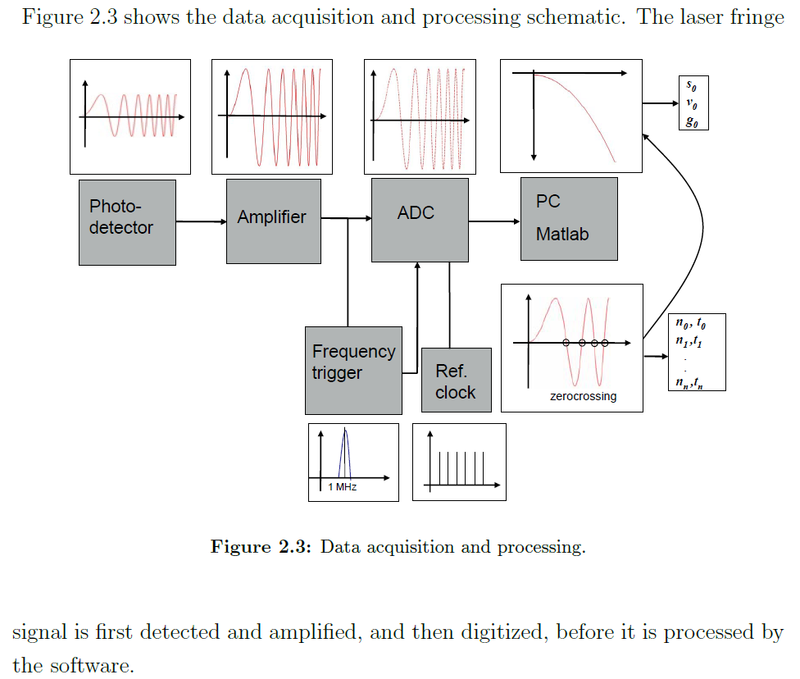 There are numerous start-to-finish levels of pre-processing, processing, averaging and interpretation of the fringe signal to get the accelerations. the gravity measurement is made in a very "noisy" background." Instantaneous vertical accelerations cause massive issues to the gravimeter; yet we know that the seas themselves are not accelerating through space at hundreds of thousands of milligals. That land-based gravimetery background noise is more stable just tells us that the lands are more stable. Gravity must be found and interpreted, in one way or the other. The crucial issue of seismic data acquisition in ice covered waters is to protect the seismic equipment from being damaged by sea ice while simultaneously acquiring useful data in this very noisy environment. Like with gravimeters, numerous levels of filtering and processing is required. You are appealing to an interpretation of noise in signals, not a direct and demonstrable phenomenon of gravity. Edby, you have provided no source for that image. There are numerous start-to-finish levels of pre-processing, processing, averaging and interpretation of the fringe signal to get the accelerations. So what? There are 145 observations, the standard deviation is 2 microG around an average (for McMurdo) of 982972759.9 and 982865642.7 (for Terra Nova). Anyone with any experience in statistical analysis of data will tell you that something is being measured. Acceleration perhaps? You need to explain why the noise around both samples is very tight, yet the McMurdo and Terra Nova samples so different. If it were a case of general noise, both sets of observations would be indistinguishable. This was on dry land. As for ships, I already explained above how a 1cm change in height will cause 3 microGal difference. "Because the vertical motions aboard ship have instantaneous accelerations of the order of thousands to hundreds of thousands of milligals, the gravity measurement is made in a very "noisy" background." Yes that’s perfectly correct. What are you trying to prove? Newtonian mechanics tells us to expect exactly this. Instantaneous vertical accelerations cause massive issues to the gravimeter; yet we know that the seas themselves are not accelerating through space at hundreds of thousands of milligals. Oh dear. 100,000 milligals is 100 Gals, which is 1 m/s^2. I.e. about a tenth of gravitational acceleration. Exactly what you would expect on a ship, I would have thought, but I will defer to RonJ’s expert knowledge here. That land-based gravimetery background noise is more stable just tells us that the lands are more stable. They are as stable as my land-based data above suggests, i.e. with an error of about 2 microGals. You are citing data collected at sea. Different thing. I didn’t say it was a ‘demonstrable phenomenon of gravity’. 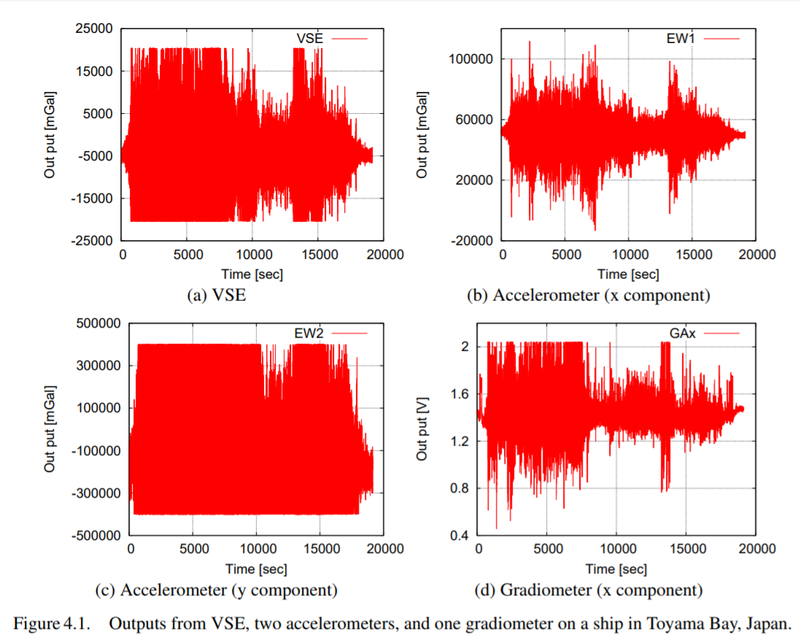 Acceleration is the quantity being measured, and the data above shows the measurement is accurate to a few microGals, which is very precise. You need to show these devices are not measuring acceleration. [EDIT] This https://www2.mst.dk/udgiv/publications/2000/87-7944-019-3/html/bil05_eng.htm explains that the 'heave' acceleration on a ship can be 2.5 m/s^2, which is 250,000 milliGals. I rest my case. Gravimeters on ships wouldn't be the absolute types for obvious reasons. Since ships are generally underway and operating in seas that could be rough the absolute accuracy of any readings will depend on the conditions at sea. I have been on research ships that were doing what was called 'mowing the lawn'. We just went back & forth over a specific study area collecting data for later study on shore. If the earth were flat and undergoing a constant acceleration a gravimeter on a ship would just record random data and wouldn't show anything meaningful. Even in rough seas if you went by a specific location and saw a obvious blip and then saw that same obvious blip on another close-by pass you have just measured something that wasn't just random noise. Since all our readings were recorded on a big chart recorder along with very accurate GPS readings you could tell exactly where any recordings were being made. Again, it sounds like Tom is just arguing about the accuracy of the measured gravity readings not the fact that they are obviously there and have been made millions of times by thousands of people. Just what more evidence would anyone need? signal sampled far below the Nyquist criterion (table 1). Multiple methods, functions, to "extract" the gravity value from the "noisy fringe signal"
This method has been developed by Niebauer et al . parts in 10^9 of g [10, 18] or even larger [12, 16]. original, though complicated, algorithms have been developed. This document was written in 2010. If this is simple "direct measurement of the acceleration", as you suppose this is, then why was it was limited by pre-2010 computing capabilities? It is not direct at all. It is the many algorithms necessary to interpret the "noisy" fringe signal that need large amounts of computing power. It is interpretation of a noisy fringe signal; that's all it is. 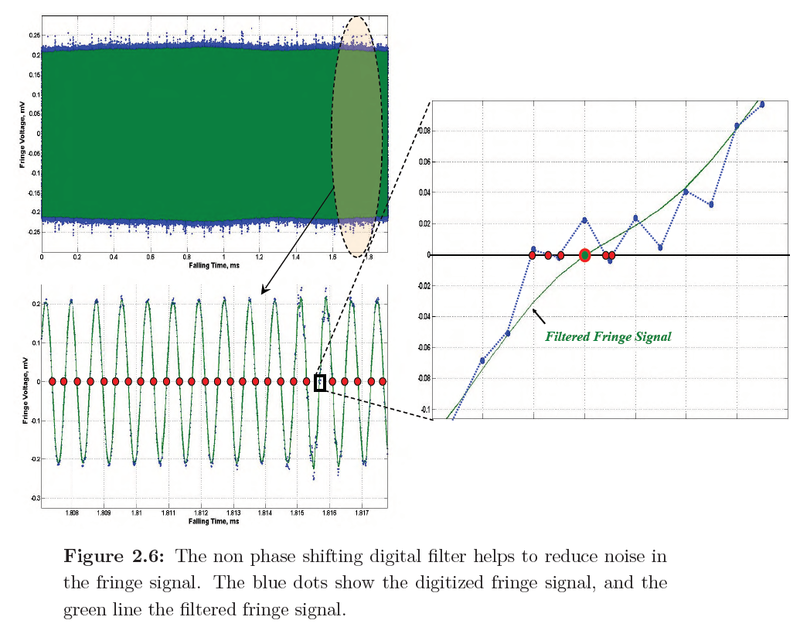 Therefore, a combination of the different methods of fringe signal processing in the same instrument is a useful tool to compose a more complete uncertainty budget. Yes, there is plenty of noise to deal with when you are trying to get every ounce of accuracy out of a gravimeter. It's like measuring the depth of a swimming pool before & after you've thrown in a glass of water. All you are arguing about is if the glass was half empty or half full before you threw it into the pool. Years ago when I was flying airplanes all the time I might be flying above a layer of clouds. Air traffic control might tell me to descend to 3000 feet and fly heading 240. Maybe the signal was a bit noisy the first time and I would ask for a repeat. After hearing the transmission a second time I would usually be satisfied with the info. At that time I would bet my very life that my information was correct as I descended into the clouds and depended on air traffic control to keep me from colliding with another aircraft and killing everyone. Maybe the gravimeter information was a little noisy at the extremes of the measurement accuracy range. Then reading after reading after reading was taken giving multiple confirmations. There's really no doubt about the fact that you are taking the readings of the earths gravitational attraction. You might not know the exact reading 4 or 5 places to the right of the decimal point but after taking multiple readings your confidence in those figures are high. The other fact is that the earth itself is noisy. All kinds of natural forces are at work that can cause small variations in the readings. That very fact is very comforting. When you are seeing small variations you have a good indication that the equipment is working normally. If I was checking a HF communication radio and was wondering if the receiver had good sensitivity and could receive a signal, I would usually just tune to one of the time broadcast frequencies. Normally I would hear a transmission from one of the many time signal broadcast stations, worldwide. Maybe the time signal was weak and buried in the noise. Usually after a while I could get the time even buried in noise if I listened to it enough times. At that time I was confident that my reading was accurate and I could depend on it 100%. Gravimeters usually have a good self test feature that gives you a quick idea if all the equipment is properly working. At that time even if the reading you are seeking is in some noise you can be sure that you will come up with a accurate measurement. As I've said before on here, I have very accurately calculated PI out to about 4 places to the right of the decimal point using just random numbers. Given that fact a gravimeter can also give you an accurate reading even if the signal is buried under a lot of random noise. The bottom line is that any noise is not a valid argument that a gravimeter is NOT measuring gravity well enough to confirm that we are on a oblate spheroid. The fact is that edby cannot demonstrate, in a clear and concise manner, that the noise is being interpreted correctly—apart from all possible physical phenomena that can cause noise—to show that what it is being analyzed and filtered is "gravity". Where in the earlier paper did we see this? 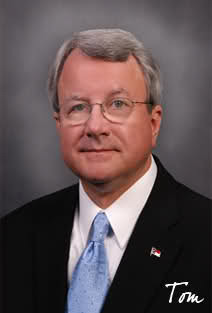 Do you understand what an uncertainty budget is? The fact is that edby cannot demonstrate, in a clear and concise manner, that the noise is being interpreted correctly—apart from all possible physical phenomena that can cause noise—to show that what it is measuring is "gravity". Posts crossed. You need to demonstrate you have understood the material discussed in the papers you cited. Also, please avoid misquoting me. I am not claiming that these instruments measure gravity. They measure acceleration.